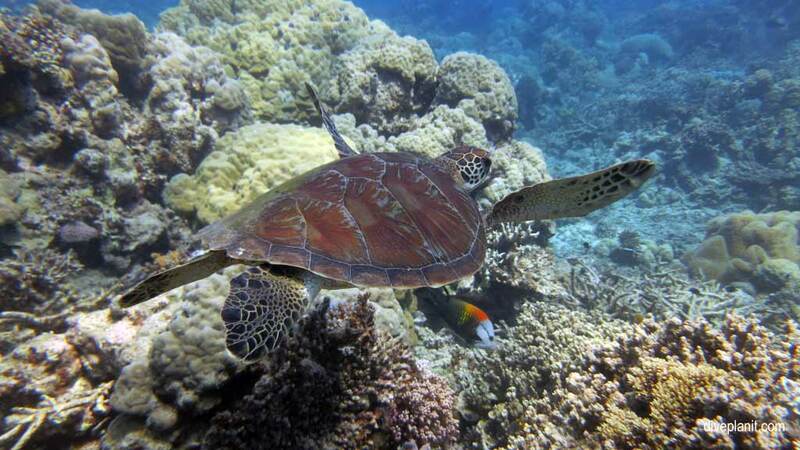 Moore Reef has a variety of sites suitable for snorkelers and others for divers. 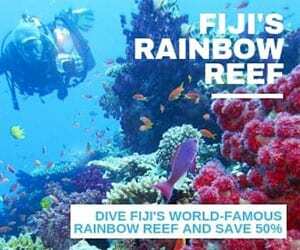 One, a group of four bommies at the edge of a shallow coral reef is referred to ‘Fish Bowl’ with good reason: there’s plenty to see at all depths, from the usual reef fish in the first 5 metres to reef sharks down at 18m. Our second dive, about 300m south west from Fish Bowl, is referred to as ‘360’. 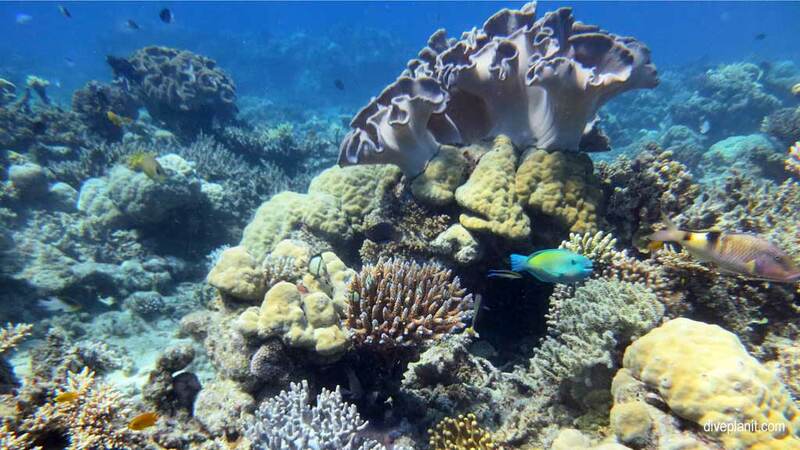 A long sloping reef, you can traverse at any depth you please down to 25m, and return along the top at around 6m. These first pictures are from Fish Bowl. The vis was clear and as the terrain is so easy to navigate we were allowed to head off without a dive guide. The snorkelers on the reef would have had a great variety of colourful reef fish, and from 15m we could see the bottom of the reef at 25m. 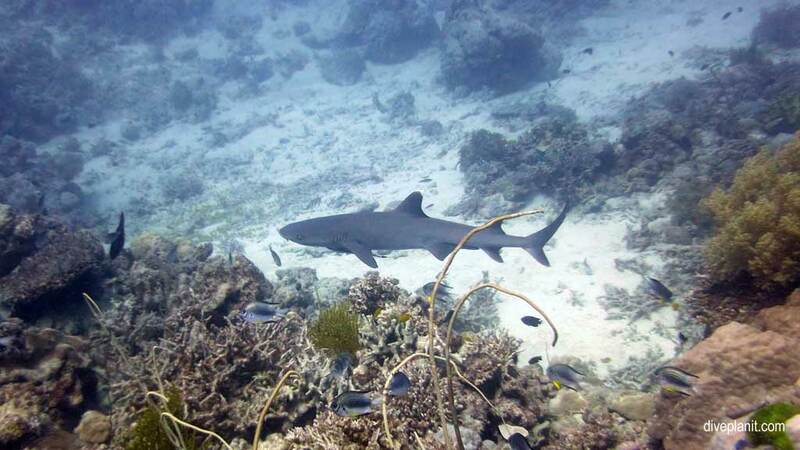 There’s plenty to see at all depths, from the usual reef fish in the first 5 metres to reef sharks down at 18m. Some damage from Cyclone Yasi is still clearly to be seen. 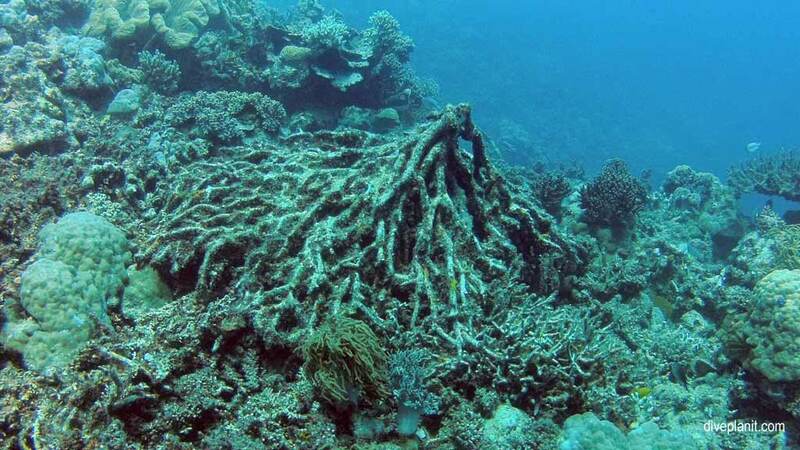 There was a branch coral completely broken and up ended – though still providing a home to fish. At one point, a whole chunk of reef had broken away and slid away from the main reef. 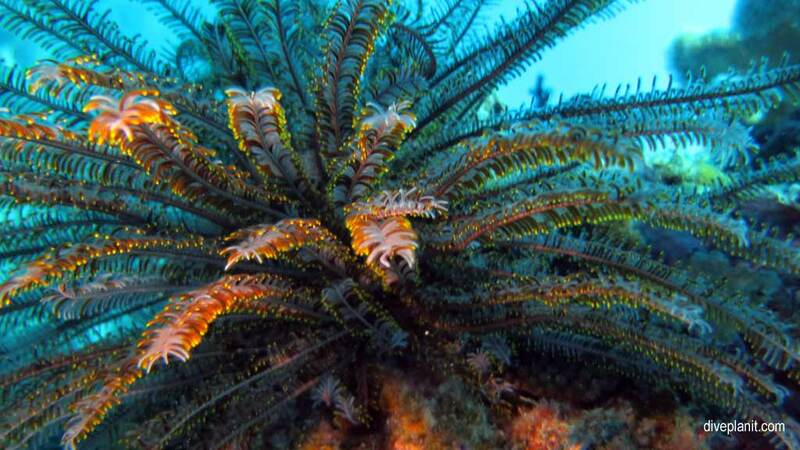 There were lots of feather stars, some gripping onto the numerous whip corals. 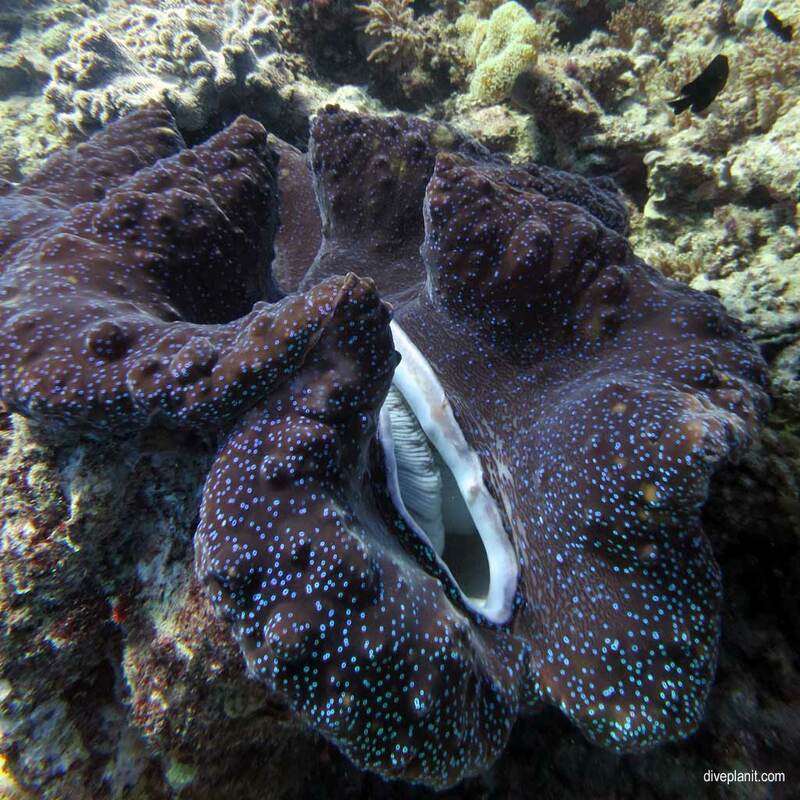 There were also a lot of Giant Clams – one amongst the biggest I’ve seen for a long time. The second dive is about 300m south west from Fish Bowl, at a site referred to as ‘360’. 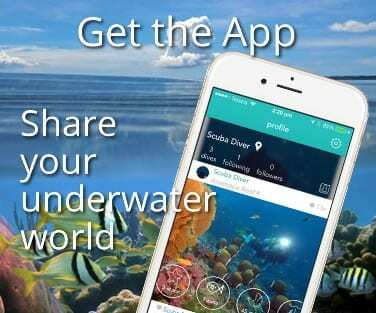 A long sloping reef, you can traverse at any depth you please down to 25m, and return along the top at around 6m. 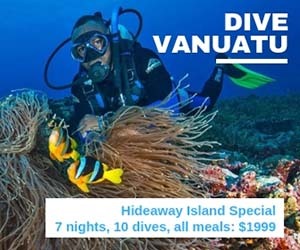 Again, good vis and straightforward terrain made this an easy dive to maximise bottom time and see a variety of sea life. 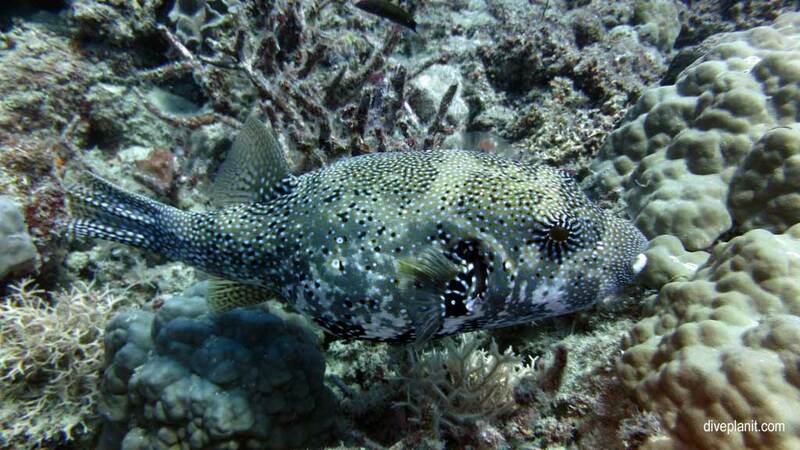 Some of the bigger specimens we encountered: a scribbled puffer (below), a speckled grouper, and a banded parrot fish. 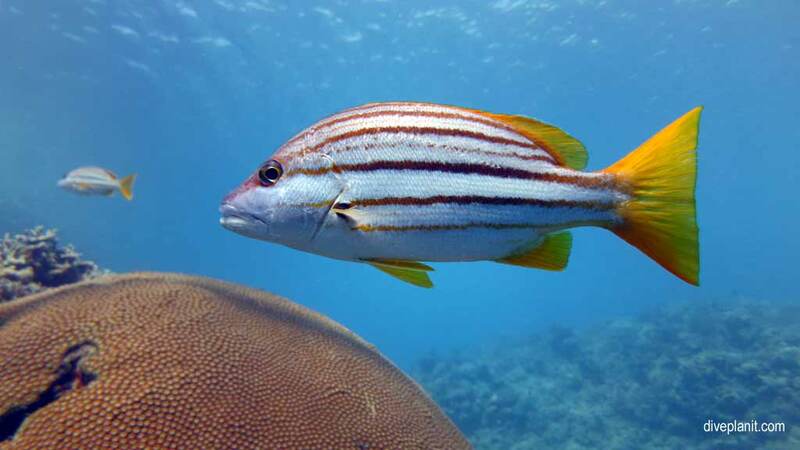 There are also the usual Sweetlips and lots of Spanish Flag Snapper. There are lots of reef sharks and we saw a total of five green turtles as we wended our way back around the top, which was mainly covered with stag horn coral. This particular shot managed to capture a slingjaw wrasse, shooting through below the turtle. 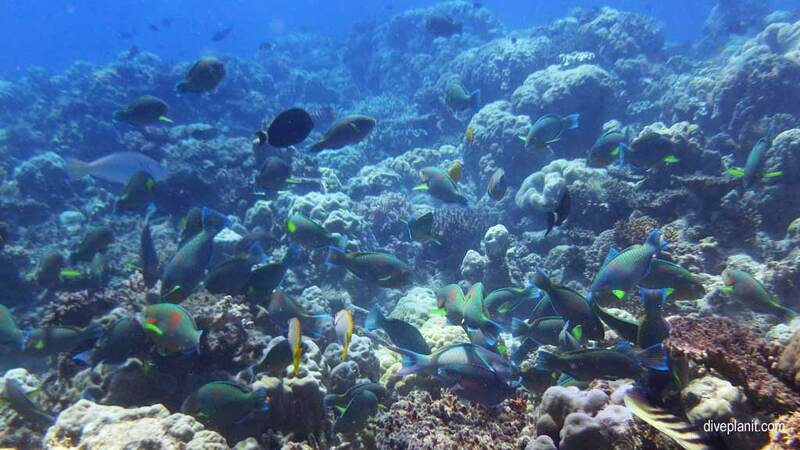 We ran into a ‘flock’ of parrotfish busily grazing on the algae keeping the reefs spick and span. 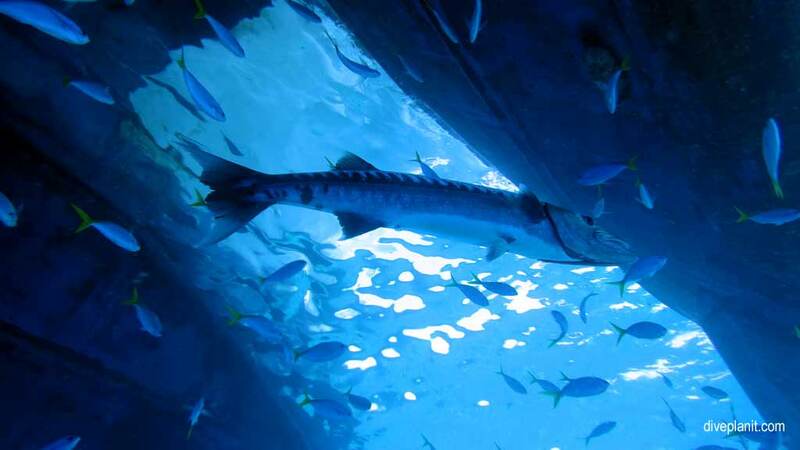 A final surprise waiting right under the boat was the Reefkist’s ‘resident’ barracuda.